I can count on one hand the number of times The Mouse House has had a sale in its 20 year existence. We don't believe in sales. We price our merchandise at fair and reasonable (we think) prices. We don't discount, except to licensed retail dealers with a valid resale license, where we offer a complimentary 10% discount on framed mirrors, artwork, and antiquarian prints. The few times that we did have a sale were in conjunction with unusual events: first time we opened up on a Friday after Thanksgiving (a bust! ); the month we moved out of Terrace Oaks Antique Mall in July, 2002 after 12 years ( a real merchandise liquidation sale... we have sinced returned to Terrace Oaks in 2005 when the mall changed owners with framed antiquarian prints and large Audubon reproduction birds. Terrace Oaks Mall is a wonderful place to shop for antiques and, of course, our merchandise in Charleston. ); and when I paint downstairs gallery rooms. While Susan is in Maine, I am going to tackle a few more rooms that have not seen new paint since 1990. 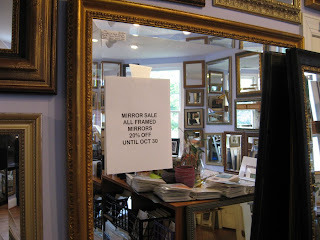 So until October 30, all FRAMED MIRRORS in the gallery will be DISCOUNTED 20%. You may have to walk around drop clothes and ladders and breathe in paint fumes, but there will be some exceptional values to be had. Normal business hours will be maintained as best as possible, and I may not be answering the phones regurarly. Please leave messages as they will be returned and times when you want to come and shop. Since 1989, The Mouse House has owned a white utility GM van. In our first van the passenger seat had to be added as an option, and we had to install an old Blue Bird Bus bench seat in the back to transport our infant children legally (at least sometimes). We even took my mom (deceased in 1998) to Charleston in June 1989, who volunteered to sit on a pillow in the back (the bench seat only had one seat belt for Mathias' car seat). I found out later that she was not too happy with me (another long story!). We went through 4 utility vans over the next 18 years and drove each one of them until they fell apart. They were perfect for our business. Susan and I decided this year that the one we owned was going to be our last. I was hoping that it would make it until Susan returned from Maine at the end of Oct. (check out her blog), but the transmission decided to fail in Charleston two days before we left for Maine, with Susan driving. She did managed to drive back to Columbia without reverse and 1st gear (a "Little Miss Sunshine" moment for sure). 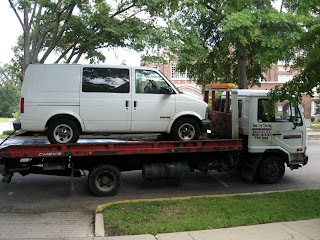 No one wanted the van, and therefore I decide to donate it to ETV/NPR. This relieved my guilt of not donating any money to this wonderful organization in the last two years. I hope it sells and will let you know what it brings. My mode of transportation for the next 5 weeks is Susan's blue moped. I hope it stays dry. Siren showed up on our doorstep, rather the back patio, sometime during the late spring or early summer of 2002. Siren was skinny, emancipated, nothing but skin and bones. He decided to make his last stand in our back yard. 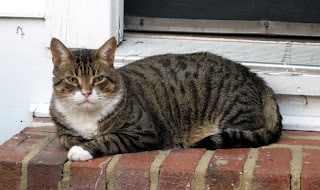 Katie Caggiano, our last employee and confessed "cat hater", could not stand the howls and siren screams (hence his name) that came from his mouth and decided to feed him outside. We had recently been given another cat named Shadow, a beautiful black long-haired part Persian but dumb as a board, who constantly tortured Katie at work. This is just what Katie wanted - another cat at work!! Katie, however, fell in love with this cat and we all nursed him back to health. For the next six years this cat, who had no chance of survival, lived in and out of The Mouse House and even taught Shadow how to beg and scream for food and Pounce. Siren was a loving friendly cat, my lap cat, who knew how lucky he was. Last night I tried to get Siren to come in, but he was more interested in chasing a small frog in the driveway (I think the frog got away). He often stayed out all night and crashed inside during the day. I had noticed over the past few weeks that he wasn't as active as before. He had gotten a clean bill of health from the Vet except for a front tooth that would probably come out naturally. Siren never showed any signs of pain around the mouth. This morning I heard my front doorbell ring at 7:10AM. When I investigated I saw that I left the "open but in workshop" sign on the door and thought a kid rang the bell for a laugh. As I was walking to the back door I heard a strange sound and discovered my neighbor with a shovel trying gingerly to pick up Siren and placed him in a box. He was the one that rang my bell. Siren looked peacefully asleep, but there was a puddle of blood near his head. I do not know what happened; to say the least I was heartbroken. Siren was buried beneath this wonderful portion of a tree in a garden at the rear of my lot that Susan and I found several months ago after a bad thunderstorm. 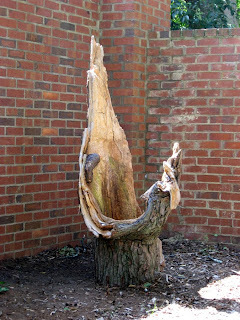 We kept it untreated so it could decay naturally. The beautiful decaying tree now has company. 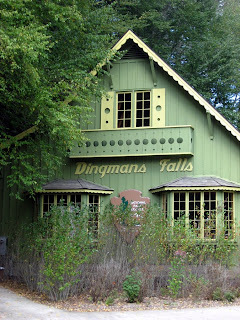 Welcome center at Dingman's Falls, located in the Delaware Water Gap National Park. 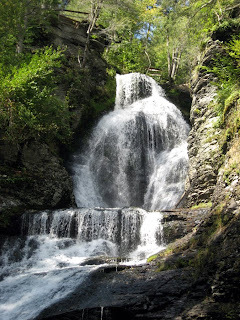 Another view of Dingman's Falls. This view is very similar to the woodblock engraving that appears in Picturesque America, published in 1874-5. 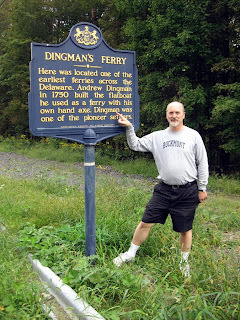 Steve in front of the road sign at Dingman's Ferry. 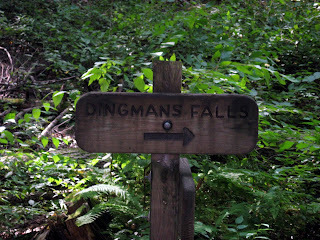 Andrew Dingman may be a long-lost relative! This is The Mouse House. 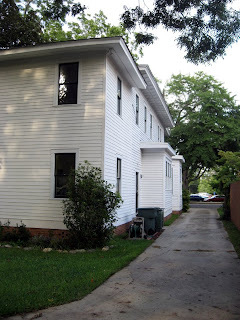 The house is an old victorian approximately 3900 Sq. Ft. built in 1907 and renovated to load bearing walls in 1990. 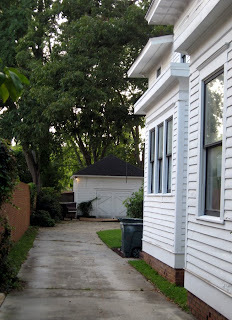 The Mouse House is located in Historic Elmwood Park, a nationally registered historic neighborhood. We have been at this location since 1994. 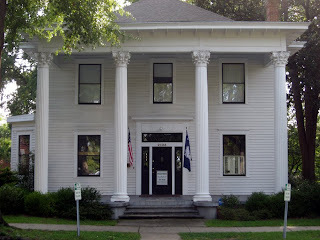 The columns on the front porch are not original but exact replicas of the ones that adorned the house when it was built. The originals are located on a building nearby. 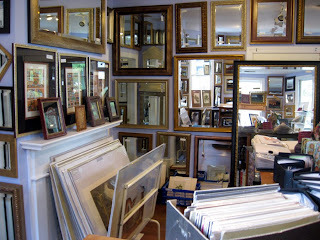 The photo shows the foyer and some of the many mirrors for sale. The baskets in the rear of the photo are original fiber vessels created by Susan Lenz, Fiber Artist and co-owner of the Mouse House. More mirrors in the foyer of the Mouse House. 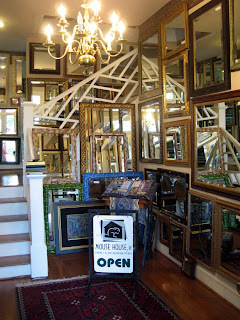 The Mouse House specializes in custom mirrors, original FiberArts by Susan Lenz and antiquarian prints. We have a assortment of reasonably priced botanicals, birds and assorted animals, architectural and landscape engravings and decorative arts from the 17th-20th century. A photo of the front gallery. 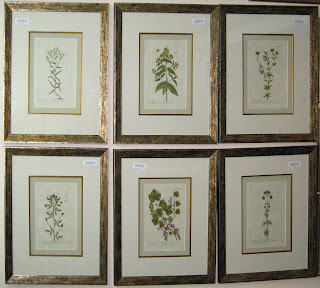 A selection of framed antique herbals from Elizabeth Blackwell, A Curious Herbal, Ca. 1780. 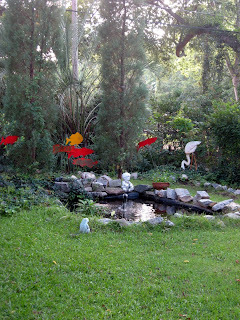 The 8 by 10 foot pond in the back yard of the Mouse House, home of many fish and a few frogs. The rear of the Mouse House looking toward Park St. The lot is nearly 160 ft. deep. The workshop is in the rear of the photo. Siren, one of two shop cats. In July, 1990, I resigned my position as a coastal engineer and tossed away 13 years of college to work with my wife and build picture frames. She was seven months pregnant with our second child and running her custom framing shop by herself. 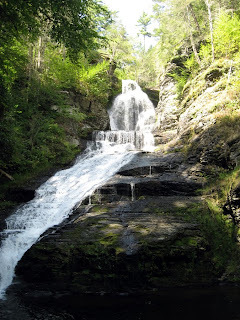 She needed help; I hated consulting engineering and was miserable at work. I needed a change in my life. 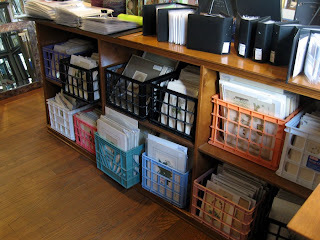 We both have always had a love of antiques, especially linens, books and old prints. 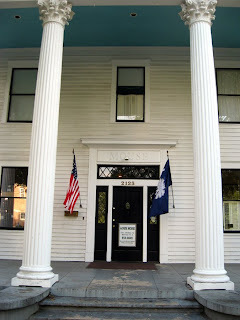 We occasionally sold our wares in Charleston at the monthly local antique show and flea market. In August, 1990 we purchased an antique print collection with all our money with no guarantee we could sell them at a profit or survive on our own as small business owners. This purchase changed our lives, and we were thrown into the world of the antiquarian print business. 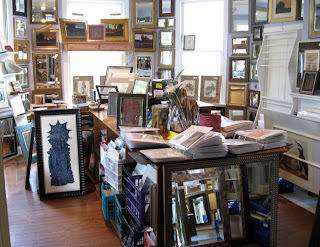 Throughout the 1990's, the picture framing business that started out as a hobby for my "wife of an engineer" grew into one of the largest and successful framing businesses in South Carolina. I spent most of this time in the garage building picture frames and occasionally traveling up north to various estate and antiquarian book auctions. We employed 8-14 people and worked all the time. On August 7, 2001, we began a intentional, forced downsizing of our business. Now the business is just Susan and myself. I actually received a promotion to gallery manager. I hope to use this blog to introduce what I now do in the business and show what we sell. 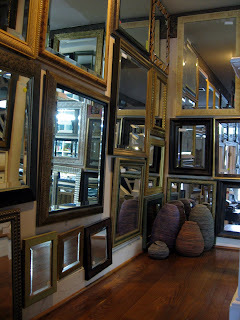 We have consistently been a place where one could purchase reasonably priced antique prints and custom mirrors. I hope that in the near future I can show the cyber world what is available at the Mouse House.